Wham! That struck home. Aoife van Linden Tol, our winner of the week, has made a real hit with her intervention – and she’s managed to do so without adding anything that wasn’t already there within the sacred walls of our little Public White Cube. 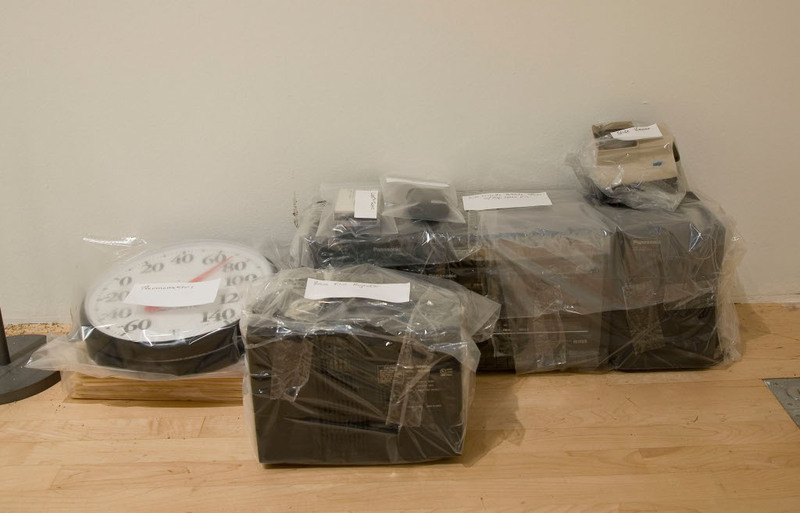 There’s not much left of Scott MacLeod’s “Situation Room” now. 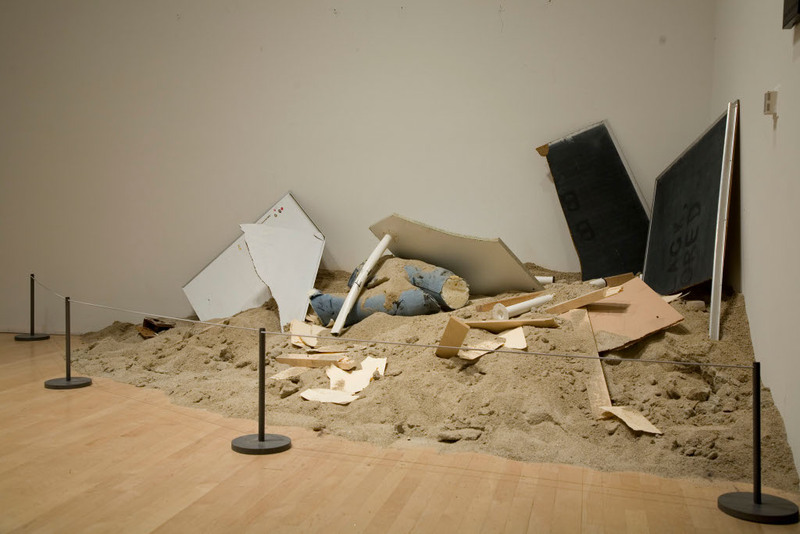 For London artist Aoife is famous for blowing up all sorts of things and scattering the pitiful remains in the exhibition space. And so she assigned us the task of turning Scott’s interior into mincemeat. From “Situation Room” to “Situation Doom”, as she calls her intervention! Scott’s white and black boards, his maps and tables stick out – or rather broken bits of them – from Ledia Carroll’s sand dunes. Aoife’s fury of destruction didn’t even stop at the dummy’s legs in their jeans and training shoes. 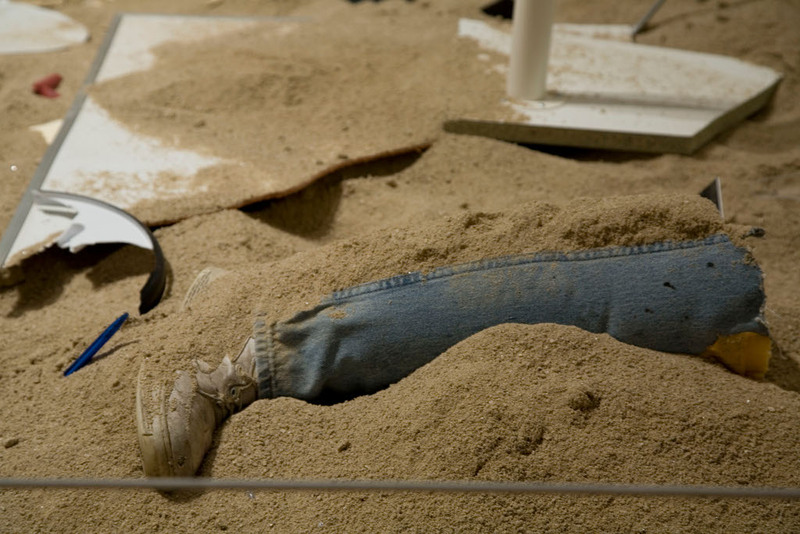 They lie among the other parts of the previous installation as if in a splatter film, lending the entire Public White Cube the uncanny atmosphere of the site of a bombing attack. 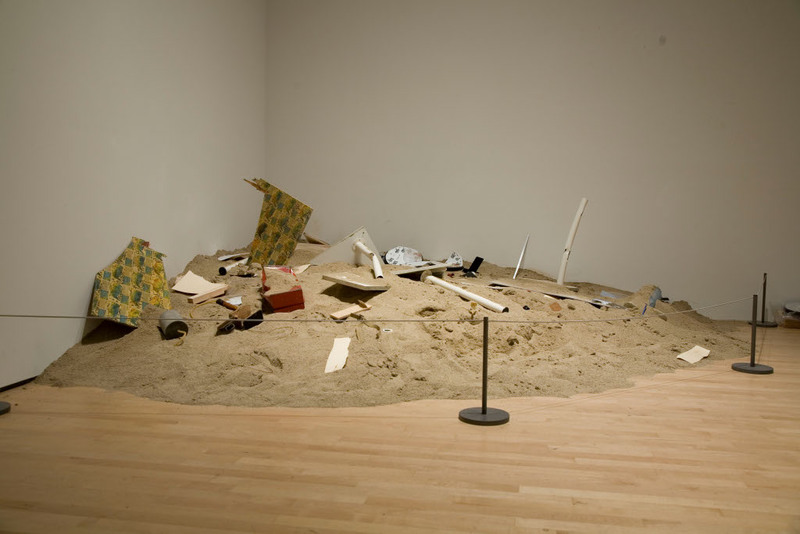 And yet, although it is almost impossible to believe: this installation seems tidy, somehow. 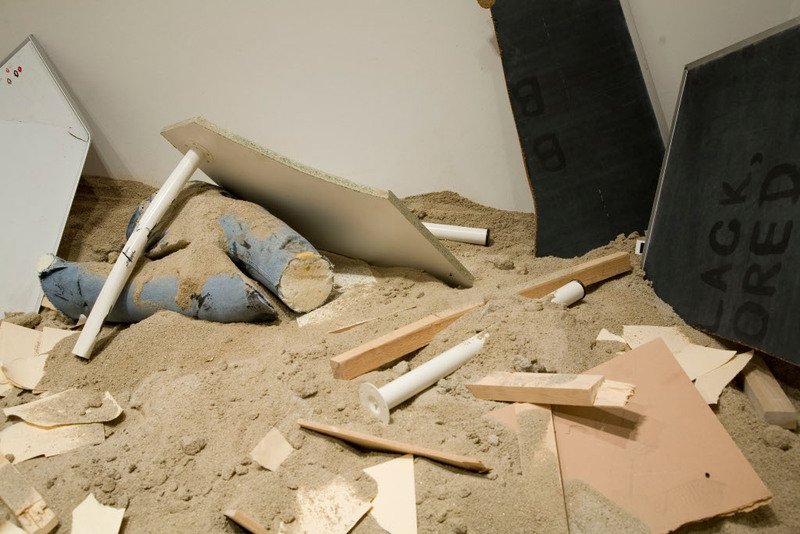 When you take a step back, van Linden Tol’s smash-up massacre has reconciled all the disparate stuff that MacLeod carted into the Public White Cube last week with Carroll’s sand dunes. 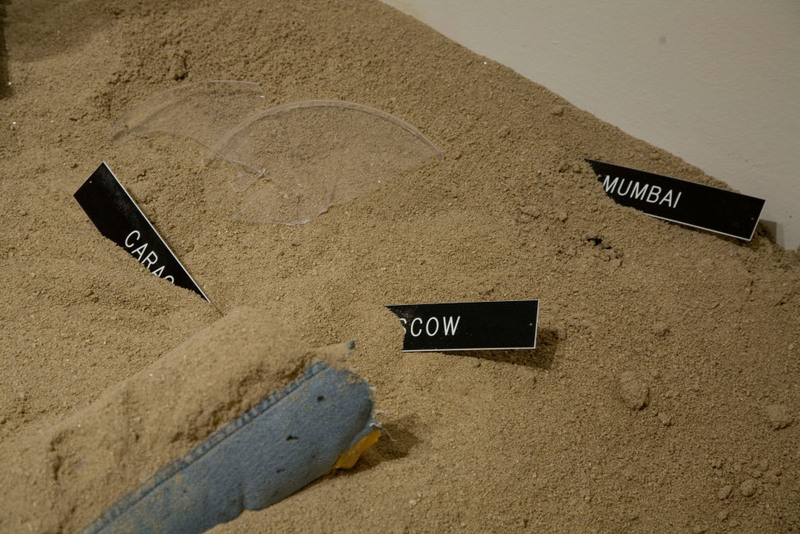 The explosive force of public participation in a museum exhibition, which led to factionalism of all kinds last week, has been subdued by an explosion, oddly enough. You’re not satisfied with this? You have a better idea, a better suggestion? Now our very last auction has began. Make your bid! There won’t be another opportunity like this for a long time. Whatever you do, you will determine the final face of the Public White Cube . To SFMOMA.The first thingI lkie to say is: That the people of SFMOMA who workt together with Aoife did a fantastic job, knowing how precise she is, they most have an intuitive good feling about what she wanted to expres. Aoife’s main idee is , to show poeple that you explosifs a tool of Art, instead. And if you go to her web side(aoifevanlindentol.com) you will see that some of her work is very delicate. She is surtenly not an agressif person who is blowing things up left right and center.It is great that she won.And I hope you all will meet her one day and you will discover that she is a joy to be with.